Cooperation with youth club UNO, workshop supervision. Cooperation with Fusion Intercultural Projects Berlin e.V., “Manege” art workshop supervision, parade float award (ranked 1st) at the “Carnival of Cultures”. 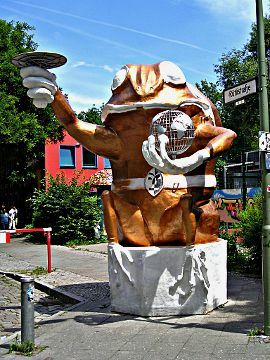 Sculpture production for the entrance area of Germany's first “youth street”, Rütlistraße, Berlin-Neukölln. Entrance plaque, “Thomas Morus Schule”, Berlin. Facade creation, community centre “Kiek In”, Berlin-Marzahn. Barbecue facility construction with youth, youth recreation centre “Eastend” Berlin-Hellersdorf. Set construction in cooperation with “Mammut”, ARD / Arte film production “Im Angesicht des Verbrechens”. Barbecue facility construction with youth, community centre “Kompass”, Berlin-Hellersdorf. Concrete animal sculptures, A12 motorway station, Lebbiner Heide and Briesenluch. Advertising column construction with youth, “Helle Info” Alice-Salomon-Platz, neighbourhood management and “Alice-Salomon-Hochschule”.